In our third year as a recreational cycling team, Alberto European Extreme Style is setting its sights on $250,000 raised for cancer research. So far we have ridden from Vancouver to Seattle twice, and raised over $190,000 through the Ride to Conquer Cancer. In Loving Memory: This past year we lost a loved friend and team-mate, Anita Cochrane. This year’s campaign is dedicated in her honour. Anita was tireless in her dedication to helping others diagnosed with cancer and I will miss her ready smile and positive outlook. The team would like to thank returning sponsors Alberto European Extreme Style, Hapa Izakaya and La Bicicletta Pro Shop who have all been with us from our first Ride to Conquer Cancer. They’ve given us support and shown a dedication to the cause that comes from being touched personally by this disease. If cancer is your cause, please consider making a donation through our team by clicking here. Once there you can read about the team, and donate through any of the rider’s pages directly. The BC Cancer Agency has a record for consistently producing breakthroughs of international significance in the fight against cancer. If you’d like to read more about their recent contribution to the discovery of new breast cancer oncogenes, and other breakthroughs you can find them here. Looking forward to sharing the roads with you on the way to this year’s ride to Seattle! The objective of this post is to add my experience to the growing body of evidence that supports people treated with bleomycin safely returning to scuba diving under the right circumstances. I was diagnosed with testicular cancer in October of 2005. I was lucky. Friends and family supported me during the diagnosis, and I was fortunate enough to live in Vancouver just blocks away from the BC Cancer Agency. The BCCA is one of the finest clinical care facilities in North America. 3 years after a recurrence that was treated with 3 cycles of BEP (Bleomycin, Etopisode, Cisplatin) chemotherapy in 2007 I feel confident that we’ve beaten it. I know I have a great number of people to thank, and will remain grateful for as long as I live. I should note that I’m not a doctor and you should rely on the advice of your physician. That said, I’ve returned to scuba diving having obtained the endorsement of my physician and in the past 3 months have enjoyed some of the most thrilling diving of my life. If you’re a diver and reading this, check out Pescadore Island, Malapascua and Apo Reef. Whoa. Getting here involved a great deal of research and talking to people and I’m hoping this post will help people in a similar situation to me. If you’ve been prescribed bleomycin, you know that one of its contra-indications is breathing compressed oxygen. The sheet I was given by my oncologist specifically said that I would not be able to scuba dive again. If you read Lance Armstrong’s book “It’s not about the bike” you may remember that there is a point where Lance is prescribed 3 cycles of BEP, but his doctors step in to say they have an alternative series of drugs that would not endanger his lungs, and therefore give him a better chance to return to cycling. The drug they were avoiding is Bleomycin (the B in BEP). The Path Back for Divers: Here’s what I found out in a nutshell. You should wait at least 2 years (3 on the most conservative side) post chemo-therapy before considering returning to diving. You can then complete a pulmonary function test and see a specialist in hyper-baric medicine to present your case and get the go-ahead. The thing is that even after completing the above with a specialist in hyperbaric medicine, he still felt constrained by the published authorities on the matter. That’s where it gets frustrating. After considering my test results and determining that there was no lung injury resulting from my exposure to bleomycin, his review of published research still suggested to him he must take the most conservative approach and support the ban on scuba. In order to tip the scales, he asked me to get the advice of the Divers Alert Network, (DAN) who are closest to the issue. If DAN gave the green light, then he would be able to as well. The medication of Bleomycin has been getting more and more attention lately. Bleomycin may cause pulmonary pneumonitis in about 10% of patients resulting with pulmonary fibrosis in 1% cases. The therapy has many faces and various evolution paths and thus there is no one answer regarding return to diving. The issue has to be discussed with the treating physician who is most familiar with your condition. The final decision will depend on your general condition, i.e. tolerance for exercise, your pulmonary functions and absence of other possible complications that may compromise safety. And by safely we mean at least the ability to rescue your self and your buddy without hesitation. PFT, read by a dive medicine physician, approved by a dive medicine physician for diving, and then approval by your treating physician. The one pre condition being that you are not currently on the medication. Thank you again for your email and your interest in DAN. If you have any questions or require further information please do not hesitate to contact DAN. I am a PADI advanced diver, and cancer survivor who was treated for testicular cancer with 3 cycles of BEP chemotherapy: Bleomycin, Etopiside and Cisplatin. I completed treatment 3 years ago, and am happy to say that my oncologist has every reason to believe that I am cured. I return every 4 months for regular checkups. I have had 3 pulmonary function tests at Vancouver General Hospital and have consulted with specialists in hyperbaric medicine. The pulmonary function tests results have shown that my lungs were not adversely affected by the exposure to bleomycin. The doctor has indicated that nothing in my test results would suggest that I should not return to diving. I have seen varying opinions about whether a person can return to diving after exposure to bleomycin, and under what conditions. I would greatly appreciate some advice as to whether I can return to diving now that I am over 3 years post chemotherapy and have completed pulmonary function tests that are negative for damage. I love to dive and the ocean is a passion of mine. Thank you for your kind attention. Let me know if you require me to become a member of DAN before you can consider my question. After reviewing this note from DAN, and considering my medical results, the physician was finally able to attest that there is no added risk to me returning to scuba diving than there would be for some other person with the same fitness who had not been treated with bleomycin. So there you go. If you want to scuba dive, you can. I’d be very interested to hear any comments from other scuba-divers who have had this question, who have returned to diving, or who are still wondering if it is safe. Please feel free to post to this blog if you have any questions. Post Script: If you or a loved one is diagnosed with testicular cancer, I recommend you do as I did and find the Testicular Cancer Resource Centre (TCRC) and pore through it to prepare yourself to tackle the treatment. The information, advice and stories there were invaluable to me in getting my mind right and gaining a sense of control. The Lancet Oncology, Volume 8, Issue 11, Pages 954 – 955, November 2007 – Bleomycin and scuba diving: where is the harm? I just read the following blog post from Paul Balfour. Paul captains the Phillips Hager & North team that raised a total of $292,000 for cancer research at the BC Cancer Foundation last year. This year Paul has already raised over $60,000 personally, and his team will surpass $350,000 raised. On the evening before our Ride to Conquer Cancer, this strikes at the heart of why we Ride. Thanks for the inspiration Paul! I think one thing that we in the fundraising community hasn’t done a very good job of is communicating just how much great progress is being made in fighting, and in many cases, curing cancer. Typically, we set out to fundraise by talking about how awful the disease is (and it is, make no mistake about that) and how incidence rates are rising etc. and but I think perhaps by doing that people get the impression that little progress is being made or that cancer is starting to rage out of control. Incidence rates for the population as a whole have been increasing but for mostly the simple reason that we are living longer and we have gotten much, much better at preventing deaths in other areas. Far fewer people are dying from heart attacks and strokes, far fewer are dying in car crashes in fact the decline in mortality rates for just about everything is quite remarkable. So, in a sort of good news/bad news story, the increase in incidence rates is concentrated in the older segment of the population living longer and having the chance to develop cancer in the first place and the drop in mortality rates in just about everything else. But progress in cancer treatment is being made, year in and year out. It’s indisputable. Consider a few observations. Childhood leukemia used to be fatal 90% of the time. Now it’s a 90% survival rate. Because of research. Testicular cancer (Lance Armstrong) used to be a very serious disease. It still is, but the survival rate is now 96%. Due to research. Outcomes in breast and prostate cancer have improved in recent years to close to the 90% level. Thanks to research. There is a disease called CML (Chronic myelogenous leukemia) that used to be pretty much fatal. Scientists knew it was caused by a mutated gene and one day (okay over a period of a couple of years) a drug was discovered called Gleevec and further refined to a pill form. So, you used to die from this cancer and now … as long as you take a pill every day, you’re fine. Cool. All due to research. What’s also neat is that this same drug works like a charm on a type of nasty stomach cancer. Here’s where it gets really interesting: the two cancers’ cells look absolutely different under the microscope but the same drug “cures” them. Why is that? Well, these two cancers have that same genetic mutation in common. So, what if we could do a better job of analyzing the genome of the patient for clues as to the causes for cancer and come up with other breakthroughs? Well guess what the BC Cancer Agency is doing? Exactly that! In fact the Genome Science Centre here in Vancouver is a leader (many say the leader) in this area. Ask a scientist you know sometime how hard it is to get published in the science journal Nature. It’s unbelievably hard. Three significant breakthroughs by the BC Cancer Agency and the Genome Science Centre have been published in Nature in the past twelve months. How many other centres have had three major findings in that period of time? Um, none actually. Two? None. Pretty impressive I say, right here in little ol’ Vancouver. Also, it’s an open book here we share that research with the rest of Canada and the world, make no mistake about that. But it takes money. It takes a lot of money to keep this progress going. There are also plenty of patients who are on the wrong side of those survivorship rates and they really need help. There are some tumour groups where we have made very little progress for decades (brain and pancreatic in particular) using conventional therapies my guess is the genome will prove to be the key here. It will take money to do that though. Please support me if you can, by donating here or at the link below. No donation is too small … and as my friend Michael likes to say, no donation is to big! …and thank you Paul! Here’s a link to his Ride page should you want to make a donation. Our cycling team has been just blowing the doors off in fundraising. I can’t say enough about the hard work of everyone on the Extreme Style cycling team, and the over 600 generous sponsors who have given to battle this terrible disease. 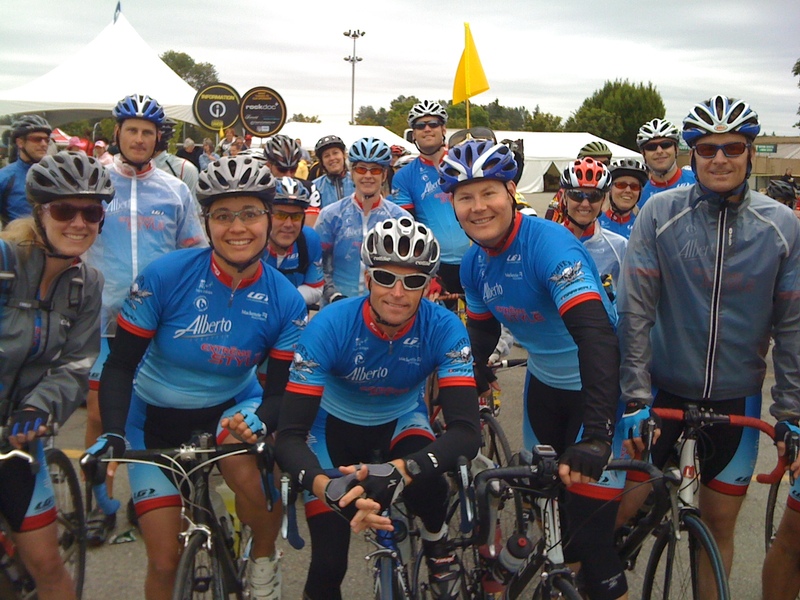 By next Sunday we will be well on our way to beating last year’s total of $90,000 raised for the Ride to Conquer Cancer. We have over 25 riders and generous sponsorship from the wonderful people at Alberto European Extreme Style. Because everyone is rocking the fundraising so well, we have the ability to share with someone who may not have the connections or resources that we do. We were thinking of all the people affected by cancer here in BC, and the hundreds of people who had committed themselves to the Ride and to raising funds for the BC Cancer Agency and the groundbreaking research they do. So here’s our idea…Alberto European Extreme Style is going to match funds to enable someone to ride that wouldn’t have been able to otherwise, despite their best efforts to meet the minimum fundraising threshold. If you know an inspiring person in Vancouver who is registered for the Ride to Conquer Cancer, please nominate them for this award. Our sponsor is offering up to $1,250 matching funds for the Ride to Conquer Cancer for one deserving cancer survivor or caregiver who has been unable to raise their minimum. To nominate, please go to our Extreme Style Cycling Team facebook page and post the nomination to the Wall, providing a link to their Ride page in the post. We’ll decide on Tuesday June 15th next week. Hope to see you on the ride, and please spread this around to everyone you know who is registered, inspiring, struggling to meet their fundraising goal, and is ready to Ride down to Seattle! 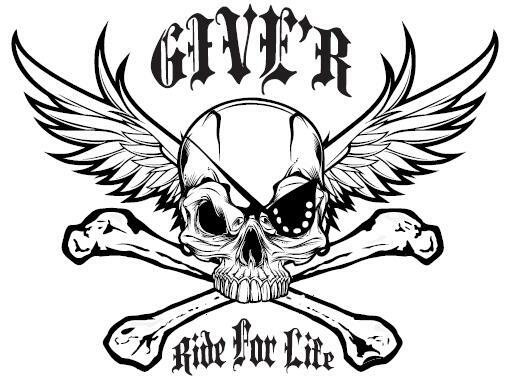 This is the story of Team Give’r and our wicked mean logo. 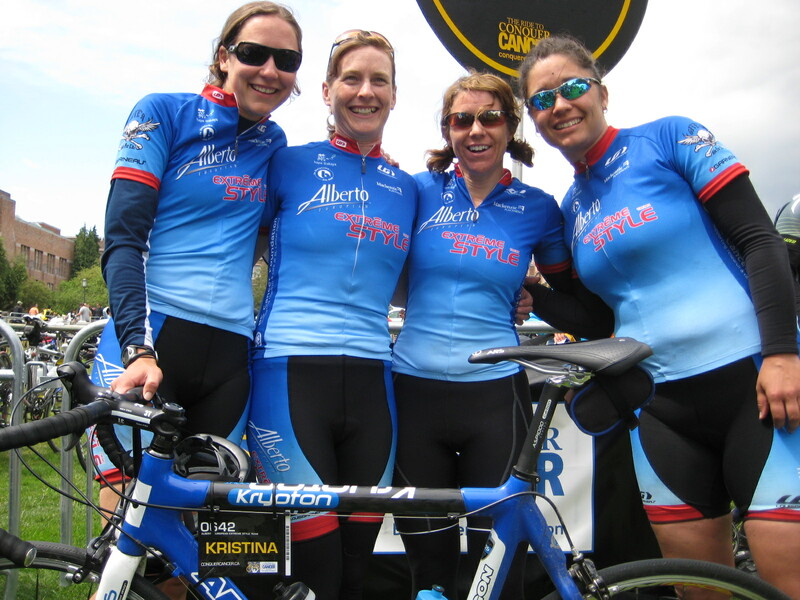 In 2009 our Give’r Cycling Team was sponsored by Alberto European Extreme Style for the Ride to Conquer Cancer. Last year we raised over $90,000 and this year we are already at $65,000 and growing every day. Our super-talented designer in residence Dean put together a beautiful blue and red kit (shown below) to represent for the brand, and we found room for the Team Give’r logo on the shoulder. To go back to the beginning, our group of friends had dubbed ourselves “Team Give’r “ after we had lazed our way through the first few days of the Juan de Fuca trek. We awoke late on the final morning with the realization that we were in danger of missing our lift out of the bush. When asked how the hell we were going to make it in time, the answer came pretty easily…Just Give’r. The name stuck. Since we have some new riders and countless new supporters on the team this year, I thought it made sense to explain the genesis of the logo and what it means…beyond the fact that it just looks mean and cool, of course. The logo is an original cancer survivor symbol that I explained to Dean in the form of a story, which he then built. The skull and crossbones, commonly found on your household cleansers, represents the life-saving poison of chemotherapy. It’s also been used for centuries as a symbol of resurrection, with the crossed bones being a nod to the cross of Christian origin. The eye patch is a symbol of Wisdom from legend, coming from the old tale of the Norse God Odin who is said to have plucked out an eye in return for a sip from the well of knowledge (you’ll have to come up with your own conclusions for why it is over the left eye…that’s a tightly held secret that I will only share over several drinks). The eyepatch is there because my own experience with survivorship is that it forces wisdom on you…pushing aside the things that just don’t matter and bringing priorities into focus. And finally the wings. I could say that they represent freedom, or the soaring feeling of surviving a deadly threat…but the truth is that Dean thought they looked cool. And that’s hard to argue with. Team Give’r was made to channel the athletic, creative and compassionate energies of our wonderful network of friends into a way to give back. We’re in year 2 now and as of this writing the team has raised $160,000 for the BC Cancer Foundation and the Ride to Conquer Cancer. Not bad. Thanks to everyone who has supported us…our caregivers, family, friends and sponsors. We ride so that some day no one need fear death from a cancer diagnosis. Hope to see you on the roads!